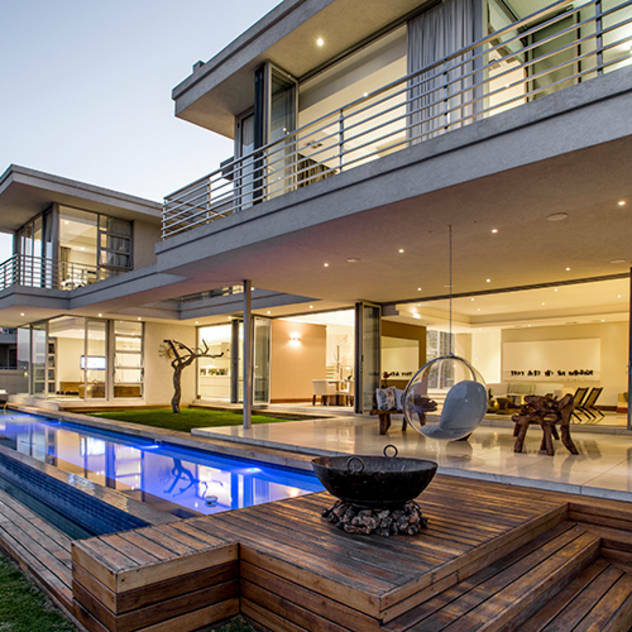 When creative and bold ideas are knitted together in a contemporary manner – we get the Residence Naidoo! 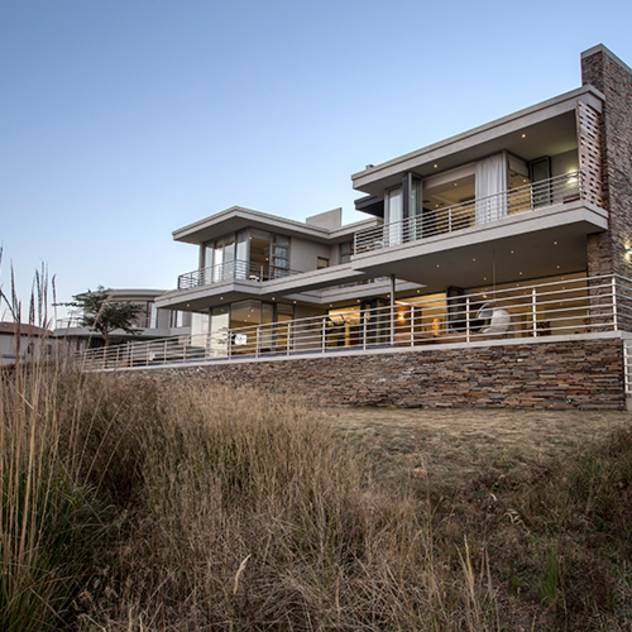 Designed by the architects at Francois Marais Architects, this villa is a modern, elegant vision that integrates the indoors with the outdoors through a fluidic open-plan design. This extraordinary home also incorporates rustic elements within its contemporary structure to offer a truly marvelous living experience. 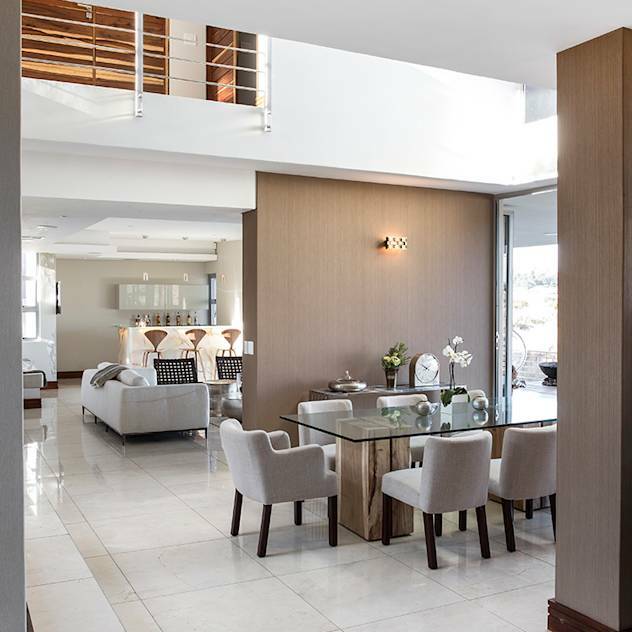 Situated in the upmarket town of Bedfordview in South Africa, this abode celebrates the beauty of sleek designs, controlled hues and soothing lights. Let’s take a closer look! 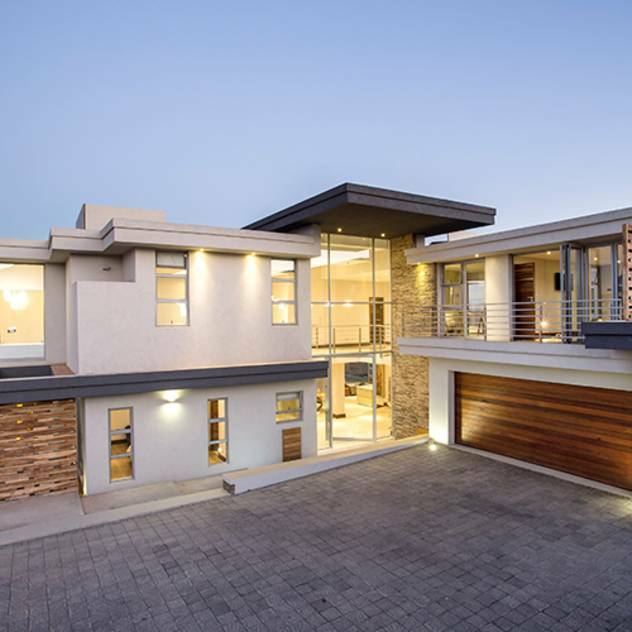 The unique, contemporary roof is the first thing that catches the eye as we have a dekko at this stellar home – this takes linear designing to a whole other level! The facade is a remarkable combination of concrete, stone and wood, creating a sophisticated effect that is enhanced even further by the generous use of glass windows. Seen from a distance, the house looks expansive and grand indeed! The structure interestingly consists of two arms that meet at a right angle. The large glass wall is a bold and striking feature of the facade, marking this home a contemporary structure. The elegant color palette of cream and grey is warmed by the rustic brown accents and yellow lights. We look forward to viewing the interiors eagerly! The high ceiling and light colors of the living and dining spaces maximize the spaciousness of these areas. As with the facade, there is a play between cool elegance and cosy warmth with the use of cream, grey and brown hues in the decor. The furniture looks comfy and modern, and the overall effect is that of classy relaxation. Ooh la la! What an incredible creation! 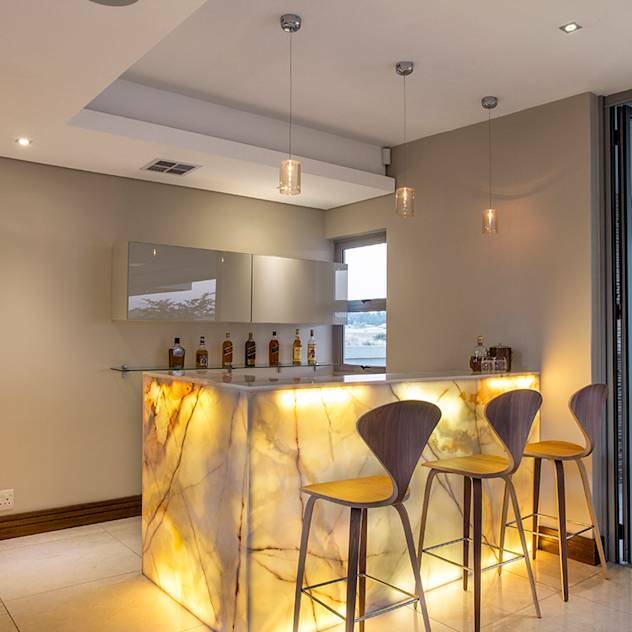 We can’t take our eyes off this totally futuristic bar – hats off to the ingenious idea of lighting up the stunning counter from within for an absolutely amazing effect! The snazzy chairs and hanging lights are completely in tune with the theme too. 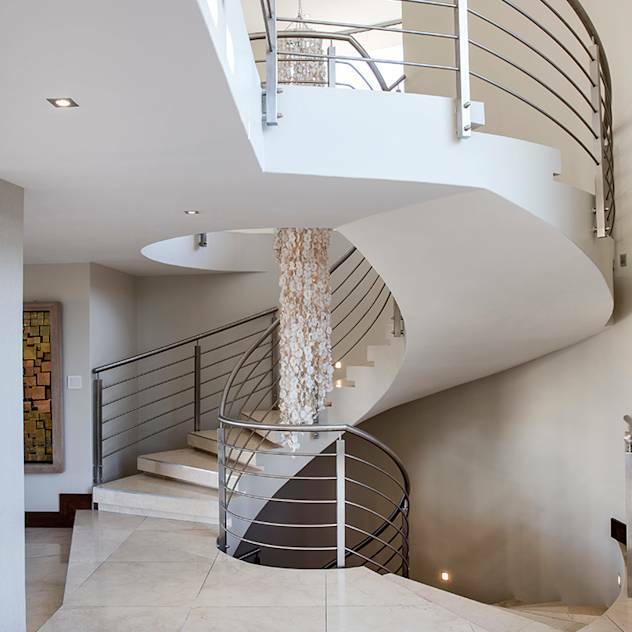 The elegant spiral staircase curves gracefully along the wall, with lights stylishly dotting the ascent. The noteworthy feature of this area is the extraordinary light that hangs in the middle – what a glamorous addition! 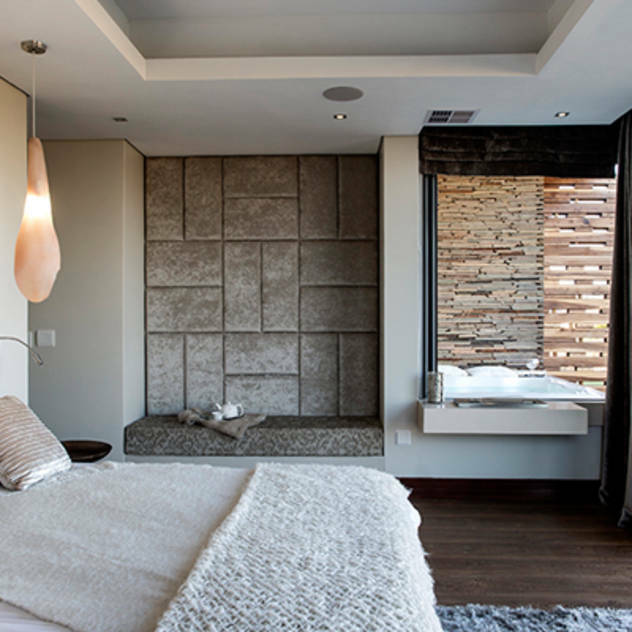 The cream, grey and brown color theme and the play between concrete, stone, and wood are equally successful in the bedroom as they were for the exterior. The ambiance in this elegant room is serene and the combination of rustic elements like the floor and seat, with futuristic elements like the contemporary pendant light, makes for a classy effect. The open balcony ensures that there is no shortage of fresh air and natural light. The patio in the backyard is part of an open-plan design that beautifully integrates the indoors with the outdoors, integrated by multiple French windows. This is a comfortable space that highlights rustic furniture. The long balcony, the wooden steps, and the sparkling pool all play an important role in making this area a linear wonder. Don’t miss the wok that ups the rustic result with pizzazz! What a pleasure it is to relax in the comfortable and snazzy swing under the embedded ceiling lights, or to watch the children run and play on the green lawn! The back of this classy home is no less imposing than the front. We love the masonry walls that infuse stylish rusticity into the structure. The open fence provides security while retaining a welcoming look. The architects have made a bold style statement by merging different classic styles and elements with confidence. 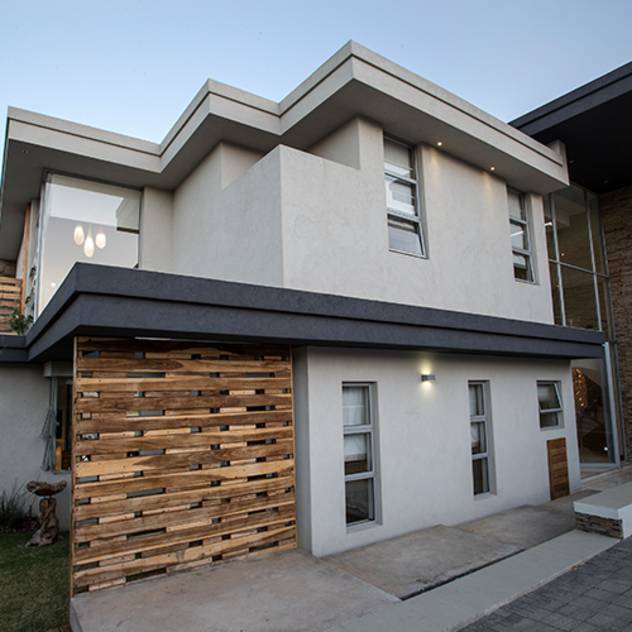 The smooth introduction of rustic features in this very contemporary home has won our approval, hands down!